[Tonbridge Cricket Week, 1894-1909.] Manuscript 'Minute Book' of the Committee of Subscribers to the Tonbridge Cricket Week, with entries signed by Tom Pawley, H. A. L. Rudd, and others, and numerous newspaper cuttings inserted. [Tonbridge, Kent.] 14 February 1894 to 29 January 1909. 285pp., 8vo, including newspaper cuttings laid down on 24pp., and one loose cutting. In contemporary black leather half-binding, with brown cloth covers, and 'MINUTE BOOK' in gilt on front. Marbled endpapers. Ticket on rear pastedown of 'W. BLAIR, | Stationer, | Post Office Buildings | TONBRIDGE'. Internally in good condition, on lightly-aged paper, in worn binding with front hinge split. Manuscript title: 'Tonbridge Cricket Week. | 1894. | First Held 1890'. Substantial manuscript ledger of a carpenter, builder and undertaker between the wars, mainly in the Ashford area of Kent, with detailed itemised accounts of a wide range of jobs (including 'Coffins and Funerals') for a large number of clients. Kent: Ashford, Folkestone, Tonbridge, Maidstone, Lydd, Rolvenden, Dungeness, New Romney, Rye, Scotney, Willesborough, Iden, Denge Marsh, Appledore, Brenzett, Guestling, Bredgar, Ivychurch, Seddlescombe, Sellindge. 1919 to 1936. 602 pages, folio, preceded by a thumb-index, comprising 301 numbered double-page openings. A sturdy and substantial volume, half-bound in brown calf with 'LEDGER' in gilt on red label on spine. In good condition, on lightly-aged paper in worn binding. 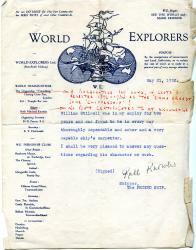 Typed Letter Signed ('Ruth Knowles'), a reference for her 'ship-keeper' William Stilwell. With four photographs of her barquentine 'Friendship' ('Emma Ernest'), moored at Charing Cross, and typed reports, with newspaper cuttings, by Stilwell's son. 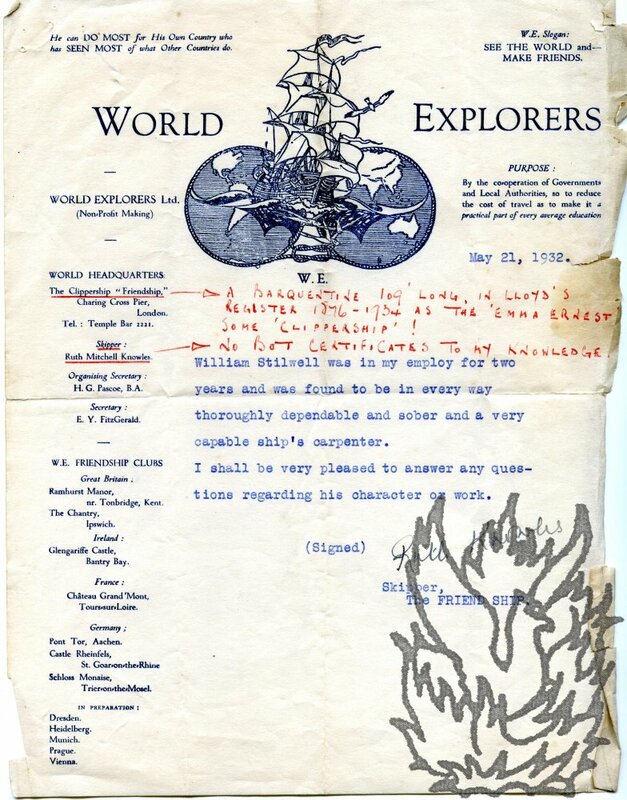 Letter dated 21 May 1932; on 'World Explorers' letterhead. The two reports from 1988, with one dated 'JS [James Stilwell] Oct 88'. An interesting collection of material relating to an extraordinary woman whose exploits deserve recognition. According to one obituary Mitchell (sister of American General 'Billy' Mitchell) was 'he only foreign woman to serve with the Chetniks', for whom she acted as a dispatch rider. Captured by the Gestapo while swimming at Dubrovnik, 'still in her bathing suit, and with papers on her that would have caused her to be executed without trial, she turned to the agents and asked: "Gentlemen, you will permit me to change my trousers?" They agreed.